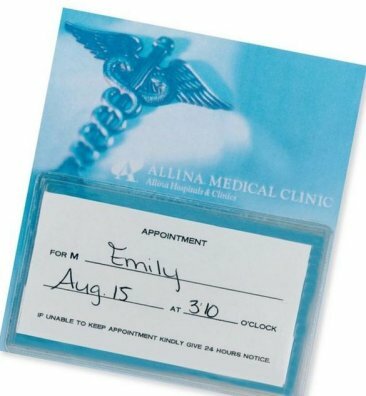 Personalized Magnetic Appointment Card Holders in Bulk. Custom, Inexpensive, Promotional. Bulk magnetic appointment card holders composed of a business card magnet and a clear vinyl pocket with a side opening for holding business cards or appointment cards. Lowest prices in the USA and Canada for magnetic appointment card holders . Free full color imprint and artwork design. American clients pay no taxes. We will send you a proof for your approval before production. Perfect for hospitals and doctor's offices! Prices include unlimited number of imprint colors (full color imprint). Item Color: White and Clear. Clear Pocket Size: 2-7/16" x 3-13/16". It will hold business cards. Typical Production Time: 5-7 business days after artwork approval; rush production is available: contact us.